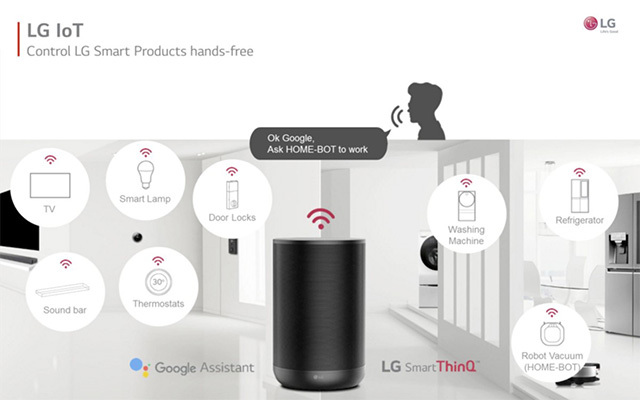 Just a week after Korean electronics major LG announced its plans to launch AI-based products under a new sub-brand called ‘ThinQ’, the company has revealed its first product in the lineup. The new ‘ThinQ Speaker’ is yet another Google Assistant-powered speaker which is also capable of seamlessly interacting with a host of LG’s IoT products that feature Google Assistant compatibility. Other than the usual Google Assistant features found in every other smart speaker on the market, LG claims that its ThinQ speaker provides better audio quality than its competitors. In order to enhance the audio quality of its smart speaker, LG partnered with Meridian Audio — a prominent British manufacturer of high-fidelity audio equipment. The company’s confidence in its smart speaker’s performance is quite evident, as it refers to the ThinQ speaker as a “premium audio product”. Alongside the release of the ThinQ speaker, LG has also revealed a refreshed lineup of its portable PK Bluetooth speaker ecosystem which now features Qualcomm’s high-quality AptX HD codec and has also been tuned in partnership with Meridian Audio. As of now, LG has not released any information regarding the pricing and availability of the new products, but the company is expected to release further details in time for the Consumer Electronics Show (CES) in January next year. What’s your take on LG’s new smart speaker? Let us know in the comments down below.